There’s money to be made in your plant. And it can be had without buying new robots, hiring more production workers, or making the R&D department work overtime. It’s a good bet your equipment and motors can be run more efficiently, producing significant savings in energy expenditures. So how can you tell if there’re savings to be had and how much there might be? Return on investment is always a good place to start. ROI is a description of the monetary value of the results and cost relationship. Are you saving more (or making more) than you spent? The relationship is expressed as a percentage over a one-year time period. As an example, assume a program to be implemented is budgeted at $329,000 and is estimated to produce a net benefit (Revenue – Cost) of $679,000. The ratio is calculated at $679,000 / $329,000 = 2.06 X 100 = 206% ROI. This means that for every dollar invested in the program, the owner reaps a return of $2.06. Understanding the ROI for any project is a significant requirement to justify funding. OEE, on a large scale, is a way to evaluate how effectively a particular piece of equipment is utilized. It is typically denoted as a number that is a multiplicative product of Quality, Availability, and Performance. Each industry and manufacturer have their own standards for what good looks like when it comes to OEE. Suffice it to say that, if a piece of equipment is causing loss of production, it is worth benchmarking against similar equipment to see if the OEE numbers match up. If they do not, there is a significant problem that needs to be addressed. As it relates to energy savings, the portion of the OEE equation is Availability. Specifically, Available Time equals Total Energy consumed during the subject time. Running Time equals Productive Energy, the energy consumed while in a productive state, meaning not idle, blocked, starved, faulted, down, etc. Performance is the amount of energy it should have taken to make the total parts if everything worked as designed, expressed as a percentage of how much energy we spent making the parts. ROI and OEE are important for defining the business needs, tracking successful projects, and providing a business justification for a project. They will also help describe a newly embedded process with the business plan and may be used to open the door to future business opportunities. A properly implemented and employed SCADA (Supervisory Control and Data Acquisition) system offers the means to perform in-depth analysis (in real-time) of your operations. 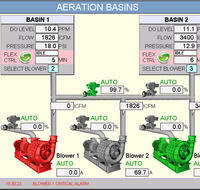 Pump station equipment operation may be optimized. In a wastewater treatment plant, there’s potential for 30% reduction in the power consumption of aeration blowers. Power quality may be monitored. Data needed to calculate OEE can be available. Downtime is easier to quantify, and key performance indicators may be analyzed. You can also benchmark your system against energy-efficiency programs or regulations. If you are in a plant with a legacy control system, there are very likely several areas where you can implement small changes that produce big savings in energy consumption. A couple of examples might be in using smarter field instrumentation or VFDs (variable frequency drives) that run equipment at a higher level of efficiency. Remote access and support to expand the ability to interact with the system when not physically present is another example. We expect to expand on some of these points in future posts. If there’s an aspect of energy savings that you would like to know more about, let us know. We’d love to find out more about your specific situation and see where we can help.